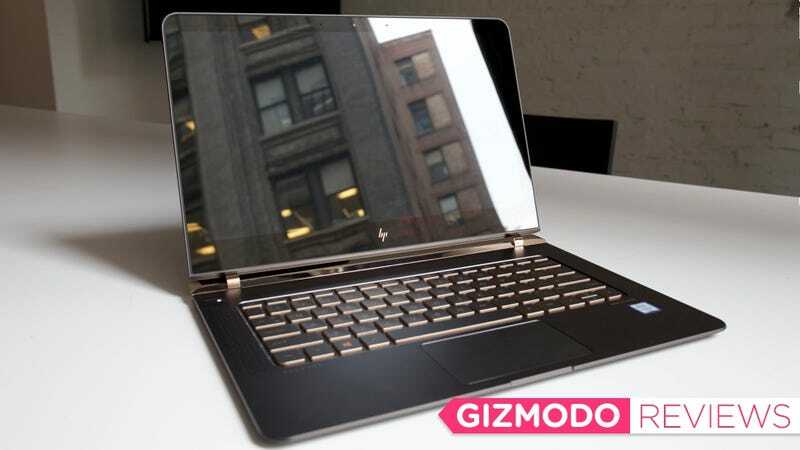 HP’s Spectre 13 is a mixture of innovation and repetition. Its singular obsession is a familiar one: make a laptop as thin as functionally possible. The result is a luxe machine worthy of your attention—but not necessarily your money. This glossy slab of processing power is simultaneously one of my favorite Windows machines I’ve tested and one of the most anxiety-inducing. The Spectre 13 is a conundrum wrapped inside carbon fiber and polished gold aluminum. It’s undeniably chic and channels that thirst for fancy, most obvious in its gold and black design. HP even made a solid-gold variant and a whole new logo specifically for its more pricey machines. HP isn’t hiding anything. The Spectre 13 is a premium laptop, and it wants you to know it. All that luxe for a little less than $1,200. But the Spectre isn’t good looking in the way that most highly regarded gadgets like HTC smartphones, Dell XPS laptops, Apple gadgets are. In a world of brushed silver aluminum, the Spectre’s gold details are daring. During my week with the laptop, that bling was actually its most polarizing issue. HP offers no other color variants, unless you want to drop mega cash on that solid gold monstrosity of a computer. So gaudy black and gold is all you’ve got. Despite its required taste, I’d still place the Spectre 13 among the best-designed laptops available, if only to awe at some of the internal engineering required to make a laptop so thin yet so powerful. Most super skinny laptops run a Core M, which is great for browsing but not much else. The Spectre 13 is running a more powerful Core i5/i7 processors which is perfect for 98-percent of your computing needs. Yet a Core i5 and i7 gets a lot hotter to compensate with all that processing power, so HP developed what it calls a hyperbaric cooling system in order to ditch bulky heat sinks and make the Spectre 13 even thinner. The very thin screen is also completely devoid of touchscreen capabilities. HP’s reasoning is very Apple-like: most laptops people buy don’t have touch interfaces. Apple’s laptops certainly lead that pack, but MacOS Sierra isn’t optimized for touch, while Windows 10 is. Windows 10’s anniversary update this summer will also be very touch-focused, and now HP’s premium priced Spectre will be left out in the cold. Many users might be okay missing out on the touchscreen, but it feels like HP’s omitted a lot of the more forward-thinking features of Windows 10 in order to make the Spectre as Macbook-y as possible. In an apparent quest to entice would-be Macbook users to Windows 10, the HP Spectre is a great laptop, both design and function. Although not as light as Samsung’s Notebook 9, the Spectre 13 is coming in well under 3 pounds, and since it’s so thin, it can also slip in most bags comfortably. The few times I had to lug my old 4.5-pound MacBook Pro home from work, the Spectre seemed all the nicer. Overall, HP’s has something great with the Spectre 13, and it’s mission to pack a powerful chip in such a slim design is an admirable one. But for $1,170 (for the Core i5 base model), it’s still a hard sell for most people. Even if you think the Spectre is the most beautiful laptop you’ve ever seen, you’re still using Windows 10, minus some of its better features. But if you want a Windows machine that looks and works like a Apple computer, then the Spectre 13 is your guy.